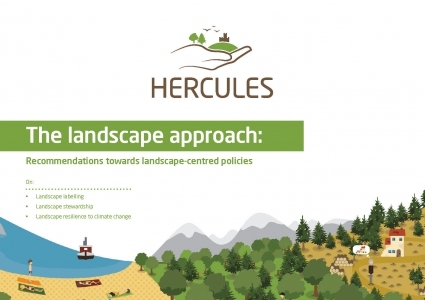 These policy recommendations are based on the outcomes of the research and the interactions with local stakeholders undertaken by the HERCULES Project. As a European project, HERCULES based its approach on the definition of landscape within the ELC: “an area, as perceived by people, whose character is the result of the action and interaction of natural and/or human factors”. At the heart of the ELC therefore is the premise that all places – be they natural, rural, urban and marine – are cultural landscapes, and they are inherently dynamic. Thus the ELC does not discriminate between or among landscapes of different value, and affords equal status to ‘ordinary landscapes’ and ‘designated landscapes’ alike. The ELC therefore represents a very different approach to older, wellestablished systems of evaluation such as the World Heritage Convention or Natura2000, covering areas of land designated nationally or regionally for a particular value (for example for their scenic, heritage or wildlife value). Under such systems, a cultural landscape is not any place that people have altered but specific places that demonstrate the highest achievements of human beings or are judged to have particular significance. It is a top-down, largely single-sector approach, driven by elites based on disciplinary expert advice but also marketing potential. Its primary tool is designation, which immediately implies undesignated areas. The HERCULES Project was also interested in heritage. Therefore, it is worth considering the concept of Cultural Landscapes as described within the World Heritage Convention (WHC). At least four different concepts of landscape can be disentangled here: one stems from garden history, where a landscape is a large designed landscape; another comes from historical geography and archaeology, to be a palimpsest of the past, judged on its historical transparency; a third comes from art history and could be a picture on a wall, or a film; and a fourth comes from ecology and is defined by the scale of an ecosystem. Why are we advocating a landscape approach in policy? The concepts of landscape within the ELC and the WHC are very different and, in their systems of governance and designation, are not easy to reconcile. Much of current environmental governance arises from the application of ‘administrative rationality’, based on the application of expert advice by administrators. In contrast, the ELC approach is overtly participative, where policies are based on deliberation informed by experts as well as the knowledge and opinions of lay people, stakeholders and citizens. We advocate such a participative, transdisciplinary i.e. landscape approach to governance because it avoids the pitfalls of single-sector or single-discipline approaches. These tend to produce solutions that are rapidly undermined by lack of wider acceptance, by developments within other aspects of landscapes or by unforeseen events. Therefore, sustainable solutions to the challenges arising in relation to the environments in which we live are more likely to flow from a landscape approach. But before a wider constituency of stakeholders can participate, an appropriate landscape governance framework must be developed by governments and public authorities. The document aims to guide this process.